Thursday July 30 1908 I did some baking and got the dinner. Art Jones and his boy were here for dinner. At two oclock I went down to Fannies to visit with Stevens folks. Some cooler than yesterday. I came home at 5.30 did evening work. Edith would have been 27 years old today. 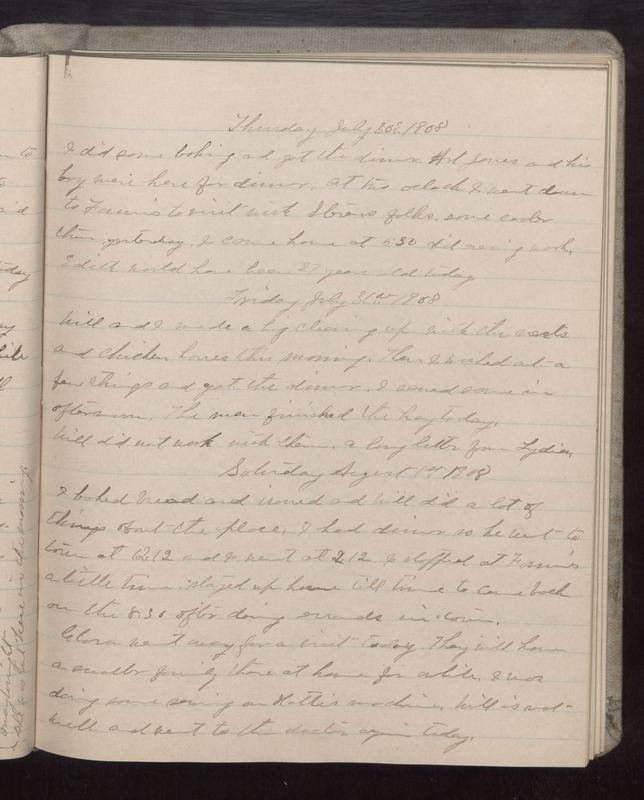 Friday July 31st 1908 Will and I made a big cleaning up with the nests and chicken [houses?] this morning. Then I washed out a few things and got the dinner. I sewed some in afternoon. The men finished the hay today. Will did not work with them. A long letter from Lydia. Saturday August 1st 1908 I baked bread and ironed and Will did a lot of things about the place. I had dinner so he went to town at 12.12 and I went at 2.12. I stopped at Fannie's a little time, stayed up home till time to come back on the 8.30 after doing errands in town. Clara went away for a visit today. They will have a smaller family there at the house for awhile. I was doing some sewing on Hatties machine. Will is not well and went to the doctor again today.